Posts here slowed down for a bit due to my participation in a poster symposium, a research group presentation, studying for comprehensive exams, and writing thesis chapters. I will continue to post at a lighter than normal rate until February. Climate science is a notoriously complex topic. We don’t measure the climate everywhere with high precision. Analysis methods have advantages and disadvantages. Signals take time to manifest, record, and analyze in proper context. A new paper in the Quarterly Journal of the Royal Meteorological Society, “Coverage bias in the HadCRUT4 temperature series and its impact on recent temperature trends” by Cowtan and Way illustrate the difference that individual analysis techniques present to researchers. At issue is the recent perceived slowdown in global surface temperature rise. Skeptics seized on this situation as their latest new argument that global warming is a hoax. Science is a slowly evolving endeavor. Climate change advocates cite decades, centuries, and millenia data to argue that global warming is man-made and accelerating. Skeptics used ~15 years data to argue the opposite. Cowtan and Way examined surface temperature data using a method combination, not just one, as groups like Hadley and NASA do. 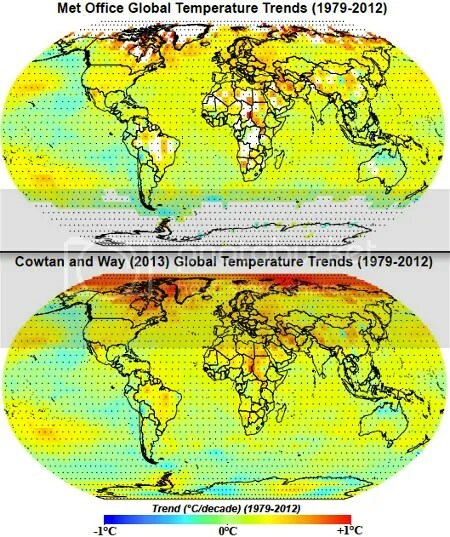 Figure 1 – Met Office vs. Cowtan & Way (2013) global surface temperature coverage and 1979-2012 trend. Where is the lack of Hadley data? It is where the most warming occurred the fastest: across the Arctic. Even the areas in Africa and South America omitted in the Hadley analysis show warming. We should all know Antarctica’s condition by now: some areas are warming, some are cooling; overall there is little trend one way or the other over this time period. But Cowtan and Way include all areas. How did Cowtan and Way achieve their result? To head off an obvious skeptic’s argument: they didn’t just make it up. They employed recognized and widely used techniques. They employed the first, “kriging“, over land and ocean areas. This method fills in data points between observing stations and includes a confidence interval around the interpolated point. One can assess the bias in the result by removing observing stations, performing the interpolation, then using the removed data as verification points. I’ve used this method in my own past research. Cowtan and Way also employed University of Huntsville satellite surface temperature data along with available surface data to fill in gaps in missing areas. Interestingly, Cowtan and Way’s analysis demonstrates that the kriging method worked best over the ocean and the hybrid method worked best over land. The bottom of Figure 1 and Figure 2 show the result spatially and temporally, respectively. 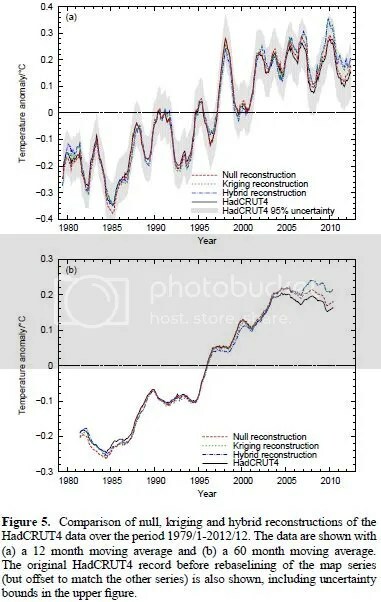 Figure 2 – Time series of temperature anomalies in the HadCRUT4 data (black solid line), null reconstruction (red dashed line), Kriging reconstruction (green dashed line), and hybrid reconstruction (blue dashed-dotted line). The bottom panel of Figure 2 shows the 60 month moving average of HadCRUT4 and reconstructed data. The hybrid result (blue dashed-dotted line) shows a lower anomaly decrease in the past 10 years than the original HadCRUT4 data, which is biased cool due to lack of data points in warming portions of the globe. There is almost no discernible difference between the Kriging and hybrid reconstruction time series data in the past 10 years. The 60 month moving average removes high-frequency effects such as the annual cycle and higher frequency ENSO. The result shows lower frequency signals, such as global warming. So what processes occurred in the past 10 years to shift the temperature anomaly trend from sharply positive to less positive? I’ve covered all of them: increased heat uptake by the ocean, especially the deep ocean: Research: Ocean Heat Content Continued to Rise Through 2010, On the global surface warming “pause”, NASA & NOAA: August 2013 4th Warmest Globally On Record; increased small to moderate volcanic activity and reduced solar maximum activity: Research: Volcanic Aerosols Largely Responsible for Recent Warming Slowdown. Lastly, the Cowtan and Way paper demonstrates that data coverage and interpolation techniques impact results and conclusions. Compared to HadCRUT4’s 0.046°C (±0.063) decade-¹ 1979-2012 trend, NASA’s 0.080°C (±0.067) trend, NOAA’s 0.043°C (±0.062) trend, and NCEP-NCAR’s 0.178°C (±0.107) trend, Cowtan and Way’s analysis resulted in a 0.119°C (±0.076) trend. This means the perceived recent warming slowdown could be less than previously thought (higher trend with smaller bias). Note that all datasets and analysis techniques indicate 1979-2012 warming. But if you care about how much warming, this paper provides a compelling argument that the significant entities engaged in up-to-date analysis should take a hard look at their internal methodology and update them as needed. This paper’s results also mean that a need for robust climate policies at every level of government still exists. Relatively minor methodology adjustments don’t preclude policy development and implementation. Policymakers may not want to hear that given their propensity to hand off decision-making to outside experts. The scientific message has not and will not change. Categories: global warming, science | Tags: analysis techniques, deep ocean heat, global surface temperature anomaly, global temperature, HadCRUT4, Kriging, oceanic heat, volcanic activity, volcanic cooling | Permalink.